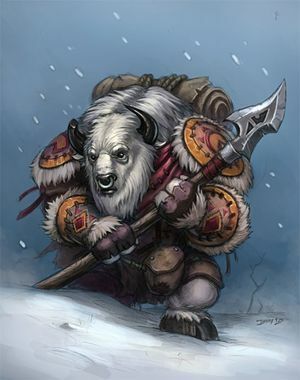 牦牛人（Taunka, winter tauren） ancient relatives of the tauren, were thought to be lost until re-discovered by Garrosh Hellscream and his orc forces upon their arrival on Northrend. Like their ancestral relations the tauren, the taunka are a hardy people who have given their allegiance to the Horde. 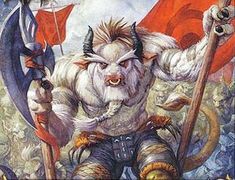 They, like their distant cousins the tauren, are involved with the spirits of the land, though after living for so long in such a harsh environment as Northrend they tend to bully the elements rather than ask them to keep their region inhabitable. Although they appear similar to the tauren, they resemble bison more than cattle. 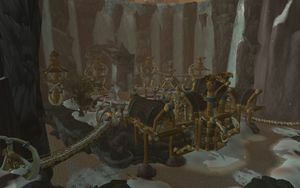 This tenacious, stoic race knows all too well the rigors of living in the harsh and often deadly wastes of Northrend. 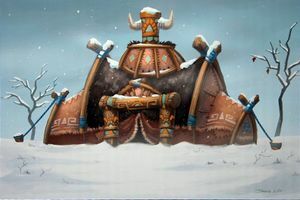 Over time, the taunka—whom many believe to be ancestral cousins of the tauren—have adapted, but only by forcing the land and the elements to yield to their will. 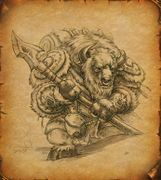 The taunka's relationship with nature, unlike that of their tauren brethren, has been one of constant struggle and grim perseverance. The taunka use black polar bear pelts in their religious rites, usually at the funerals of those who hunt black polar bears. They also collect the feathers of noble birds of prey to use in crude fortunetelling ceremonies.